This is an exciting (and unexpected) development: On Friday, country act The Band Perry premiered their new single, "Live Forever," and it's an uplifting country-pop (emphasis on pop) anthem with an irresistible sing-along chorus. 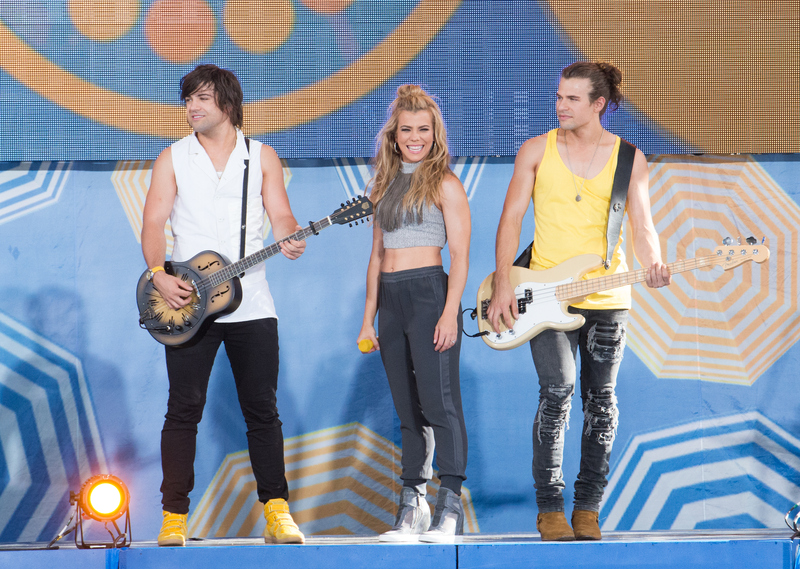 Wait a minute... are The Band Perry going pop, just like Taylor Swift did? It certainly seems that way! According to All Access Music Group, Big Machine Records President Scott Borchetta hinted that the trio would be making the transition from country to pop during his recent presentation at the iHeartMedia Music Summit in Burbank, Calif. The group — which is made up of siblings Kimberly, Neil, and Reid Perry — co-wrote "Live Forever" with RedOne, the pop producer who helped Lady Gaga craft mega-hits like "Just Dance," "Poker Face," and "Bad Romance." (He also worked on Nicki Minaj's massive 2012 single, "Starships.") So, in other words, these three are not messing around. One thing that often sets country music apart from pop music is its focus on storytelling. When Swift began making her shift from country to pop in 2010, she embraced catchy hooks (the parts of a song that get stuck in your head), but continued to tell personal stories, a practice that makes her pop songs unique (see: "Mine," "We Are Never Ever Getting Back Together," "Red," "I Knew You Were Trouble," etc.). Unfortunately, for me, "Live Forever" lacks a compelling narrative. I think The Band Perry need to keep telling memorable and emotional stories like the ones heard in "If I Die Young" and "Better Dig Two" if they want to make their pop transition work. Swift didn't make the change from country to pop overnight — she did it gradually. After testing the pop waters on her 2010 album, Speak Now, she waded a little deeper on 2012's Red before finally taking the plunge on 1989. Swift gave fans plenty of time to adjust to her new sound. I'm sure she still lost some listeners along the way, but probably not nearly as many as she would have had she just turned her back on country one day and never looked back. There are still a number of classic country elements in "Live Forever's" production, so I think The Band Perry are on the right track as far as transitioning gradually is concerned. When Swift announced that 1989 would be her first "official" pop album in August 2014, people were quick to call her a sellout — but she didn't waste time trying to justify her decision to the haters. She merely explained that pop was the kind of music she felt like she needed to make at the moment and left it at that. She seemed to be 100-percent confident in the project, and so, in turn, many of her fans were, too. They trusted her. Of course, Swift ended up delivering quality material — which is obviously very important — but I think her confidence in making the transition was also crucial to her success. Sadly, pop is still seen as a "lesser" genre of music by many. So, if The Band Perry really are making the big switch, they'll almost certainly face backlash at some point. It's kind of inevitable. However, they definitely shouldn't apologize for deciding to pursue a new musical direction. Instead, they need to stand behind their move and focus on making the best LP possible. It really is that simple. It'll be interesting to see where The Band Perry go from here. "Live Forever" is available on iTunes now.